One of the most desirable and quickest to implement renovation projects in homes in Long Island are Bathrooms. HOMEREDI expertise in delivering exquisite Powder Rooms, Family and Master Bathrooms as well as Residential Spas in the quickest time possible has enabled us to complete multiple on-going projects in a single month. HOMEREDI volume purchasing ability enables us to extend distributors, plus contractors pricing to our clients toward the purchase of all Bathroom fixtures. When you are ready to remodel your bathroom, just don’t rely on a contractor and hope for the best. HOMEREDI Design and Build approach toward each bathroom renovation project provides the best of both worlds for our clients. 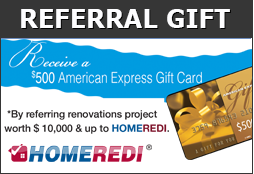 Ask your HOMEREDI Consultant to schedule a showing of some of our Renovated Bathrooms in your neighborhood.